Yesterday NBC launched a new, free, ad-supported iPad portal application that places fans’ favorite NBC shows in their hands — including features such as customization, thousands of video clips and highlights including some of the hottest SNL digital shorts from the past, as well as preview clips, photos, recaps of the latest series episodes, creative games, previews of upcoming shows and more. 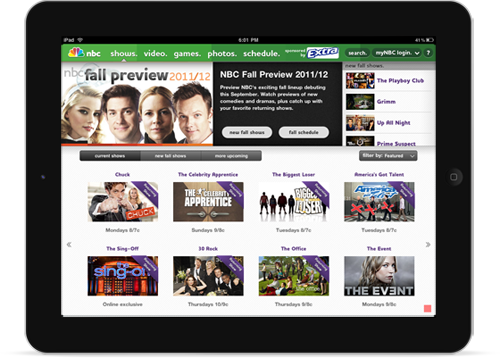 NBC chose Titanium as their development platform in order to create engaging, highly personalized user experiences. They had built “Jay Leno’s Garage” and “Late Night with Jimmy Fallon” iPhone apps on Titanium earlier this year. These first two apps set the stage for the rapid pace of innovation that would be required for their iPad project, the NBC Portal. With Appcelerator as their mobile partner, NBC has built a mobile media framework that can scale to support hundreds of new apps. They have a true roadmap for mobile.